Got Goals? How to get ready for 2017. Do you set goals at the new year? Whether you call them resolutions, or just a game plan for your business, the new year is an inspiring time to make some changes and improvements. I have some tips on what goals you should be setting for your small creative business and how to make them happen. Set a budget! Imagine having a working budget from day one of 2017. What’s a realistic amount you’ll need to spend monthly on your business? Evaluate your expenses, determine your fixed costs, and anticipate any big purchases you may need to make. Then, break it down by month. Revisit it quarterly – it’s definitely OK if a goal needs to be revised over time, but set your heart on keeping to the budget you develop. Spoiler alert: I’m going to encourage you to refine your bookkeeping system. 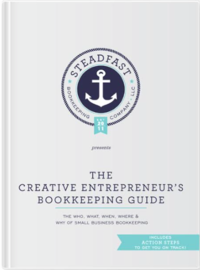 If you’re looking for a place to get started, consider reading our free e-book The Creative Entrepreneur’s Bookkeeping Guide. It has action steps as well as a checklist that will serve as its own list of goals. Give your schedule a makeover. If you are finding yourself struggling to get everything done, examine how you spend your days. Are there little changes you can implement to free up some time? Are there tasks you need to delegate? Are there services you offer that are no longer serving you and your business? Tailor a new schedule and try it out for the month of January. Reevaluate at the end and tweak as needed. Measurable – Make sure you can quantify your goals and that you can evaluate whether you are reaching them or not. The more vague your aim, the more vague your results. Attainable – I believe you can achieve anything you set your mind to… kind of. It’s important to be realistic with your goals and make sure you can actually complete them. Challenge yourself, but don’t expect magic to happen without consistent hard work and concentration. Realistic – It’s also important to make sure your goals are attainable with the resources and time available to you. You don’t want to get overwhelmed and give up entirely. Timely – Set goals that are achievable within a specific amount of time or set a reminder to check in on longer term goals. Determine a timeline for each and every objective so you don’t abandon your ideas. There are an endless variety of goals you can set from the beginning of the year – are there any in particular you are already planning on? Leave us a comment and we’ll cheer you on!